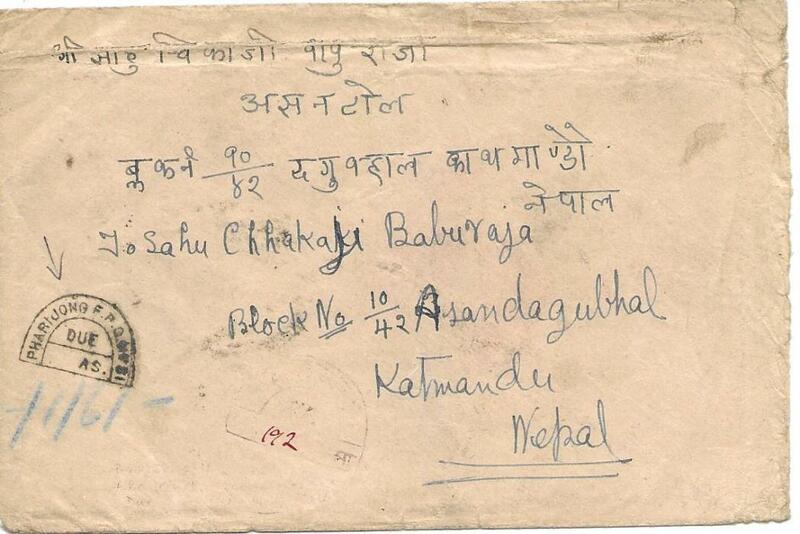 (Tibet) 1948 underfranked cover to Nepal bearing on reverse 3p. and 1 �a. 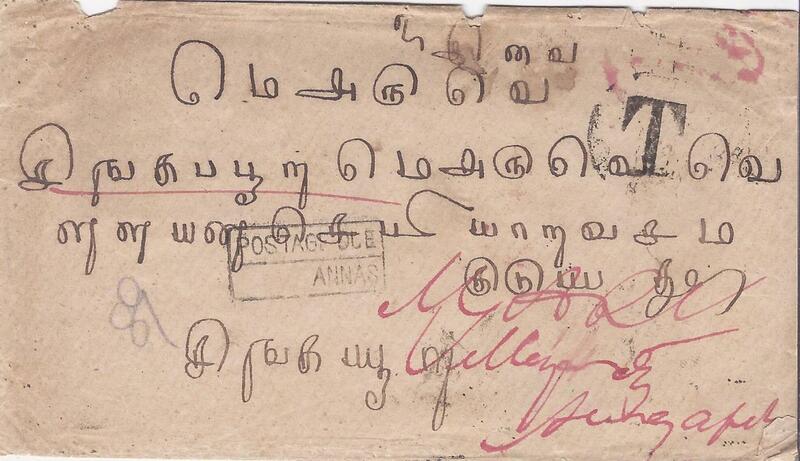 tied Pharijong date stamps, cursive framed postage due handstamp of Pharijong and larger unclear one, presumably arrival alongside. 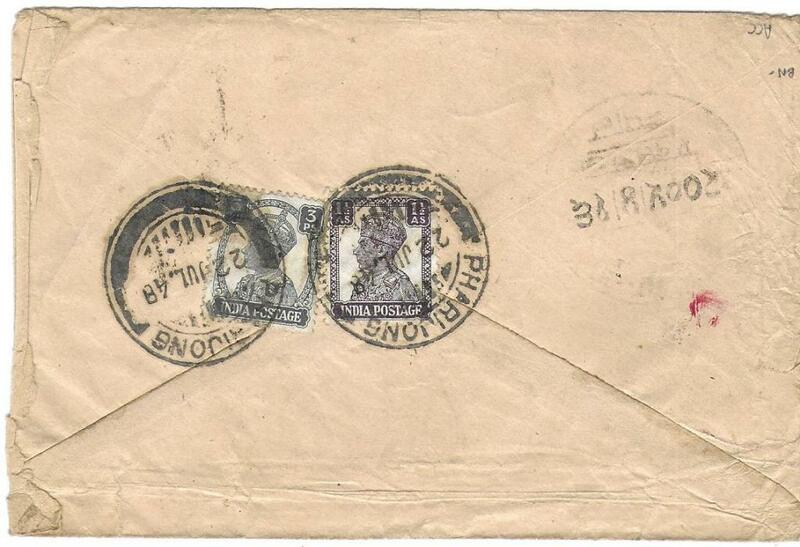 (Used Abroad) Undated and unfranked cover to Bombay cancelled on reverse Busreh cds of 2 Mar and Bombay arrival of Mar 17, also with framed POSTAGE DUE/ �1a� charge. 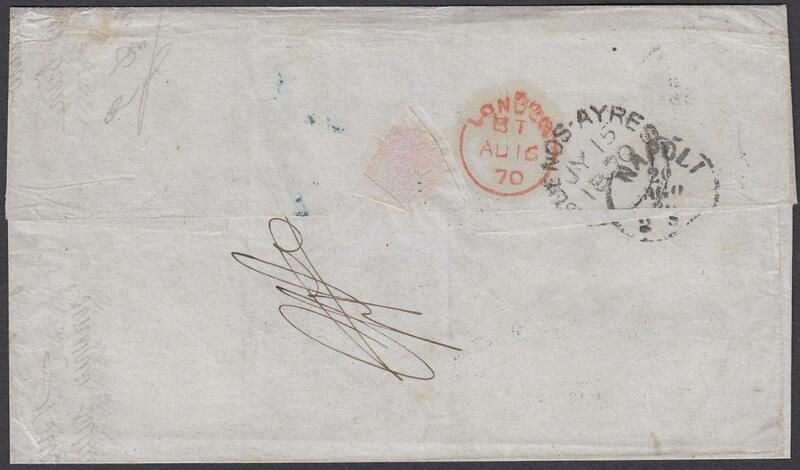 1870 wrapper put into the British post at Buenos Ayres, addressed to Naples. On reverse LONDON transit with their accountancy mark 'GB/1F60c' on the obverse alongside the subsequent French handstamp 'F.56'. Rated 10 decimes on arrival and 1L postage due affixed. 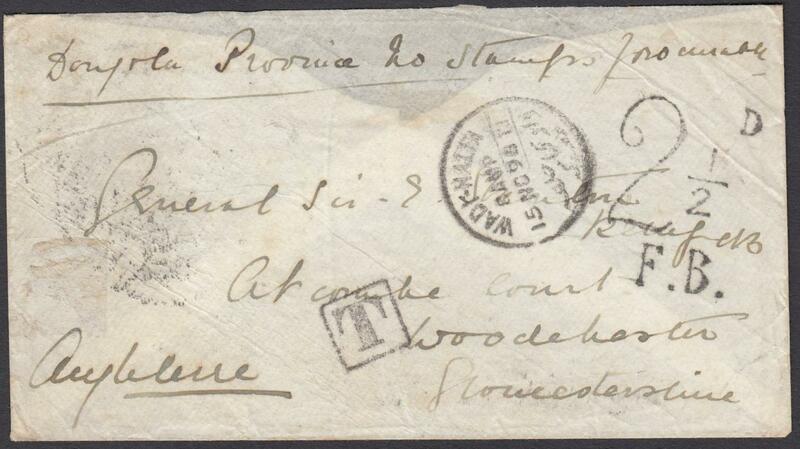 1873 (AU 7) outer letter sheet to Genova franked Great Britain 2d., FI, plate 14, tied A26 duplexe, endorsed �pr St Tyrian�. As the 2d. rate only covered carriage to port, a 40c. 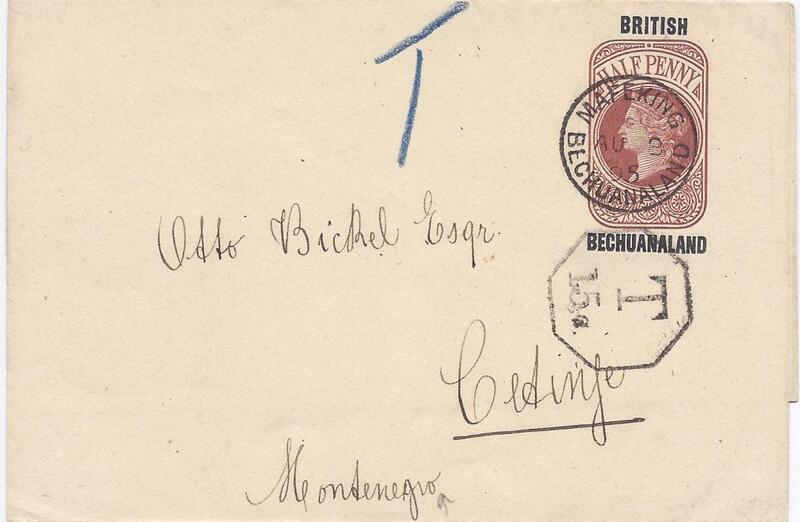 Postage Due was applied with agents handstamp alongside and tied arrival cds. 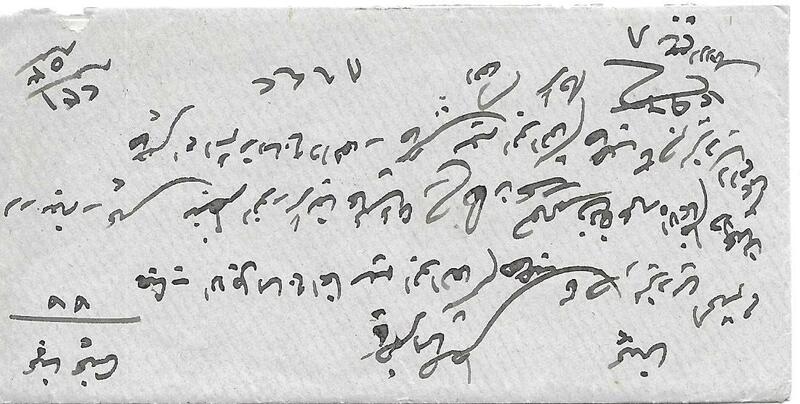 Postage due stamp creased and 2d. with ageing around perfs. 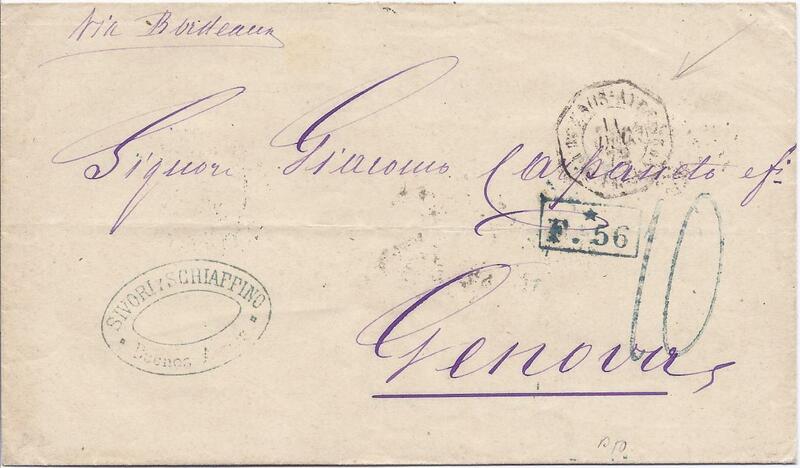 1873 stampless outer letter sheet to Genova bearing Buenos Aires company handstamp, rate handstamp '10' and framed 'F. 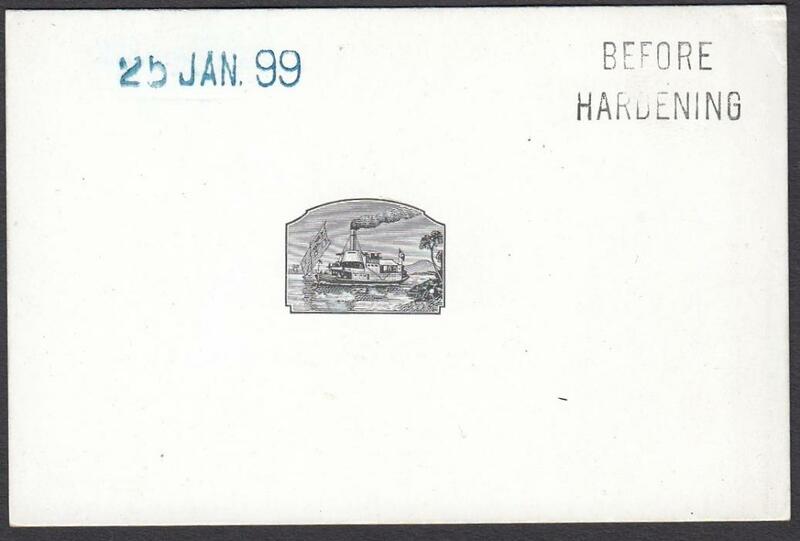 *56' acountancy, somewhat unclear French octagonal maritime Buenos Aires date stamp, reverse with Paris transit and upon arrival 1L. Postage due applied and tied cds; fine condition. 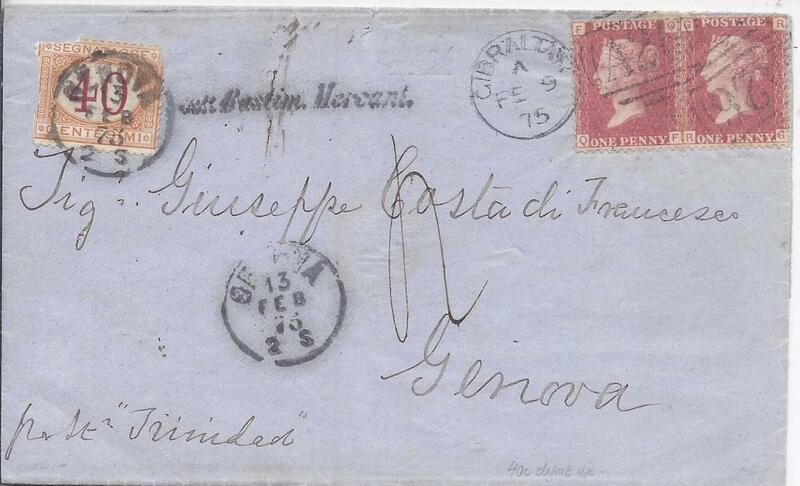 1875 (FE 9) outer letter sheet to Genova franked two Great Britain 1d. red, QF and RG, both plate 159, tied A26 duplexes, endorsed �pr St Trinidad�. As the 2d. rate only covered carriage to port, a 40c. Postage Due was applied with agents handstamp alongside and tied arrival cds. 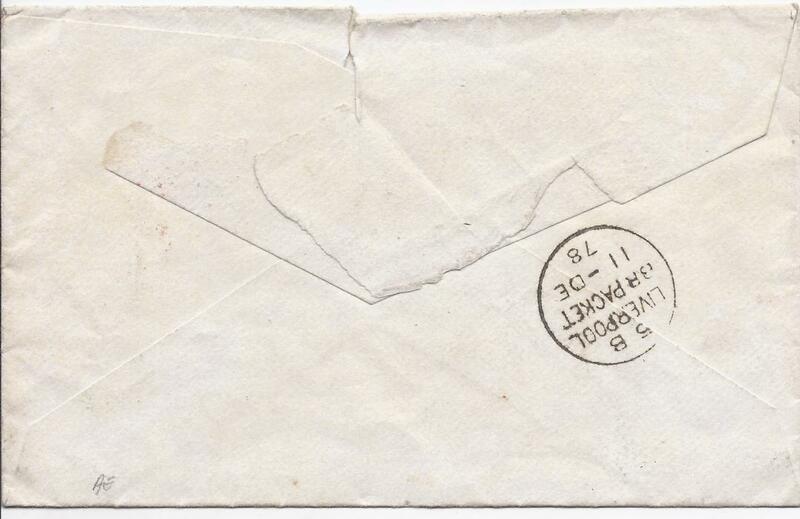 Postage due stamp damaged. 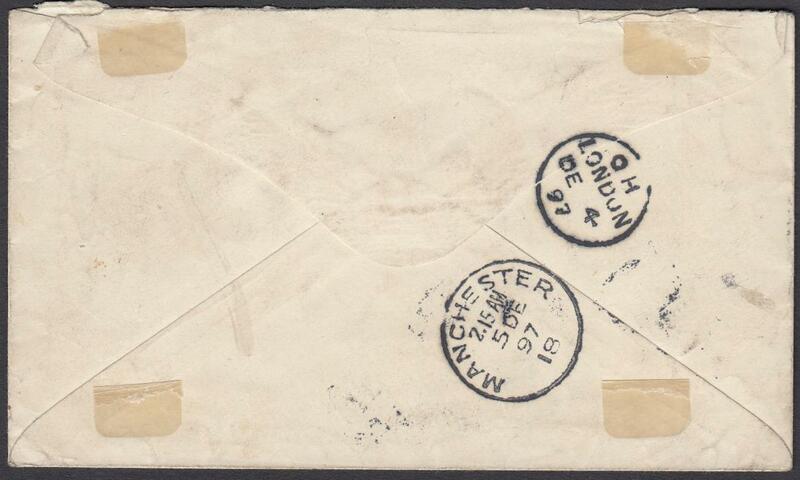 1883 cover to Dover bearing single franking GB 2�d, FJ, pl.23, tied duplex. 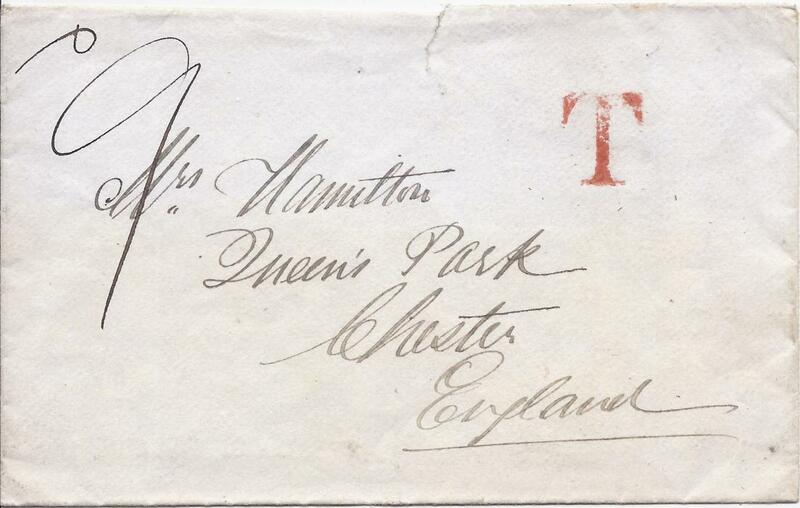 A heavier double rate cover so 'T' applied and a 'type 2' ship '2' applied in error, this being over-struck with a barred oval. 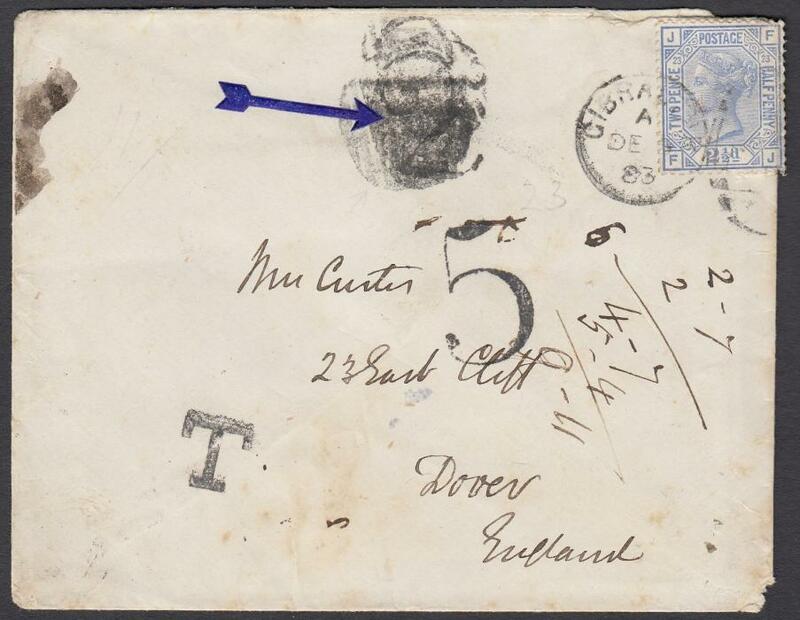 The '5' handstamp was applied in Dover; some slight toning and stamp perfs damaged as overlapping envelope. 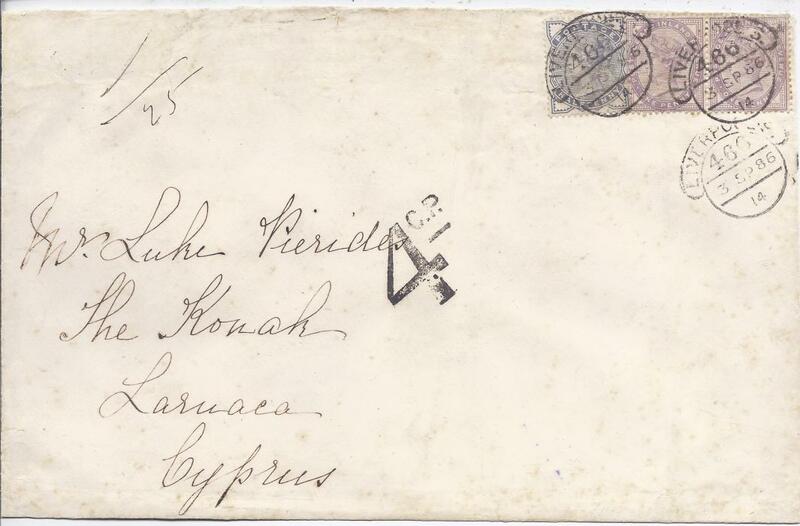 1886 incoming cover from Liverpool to Larnaca, underfranked with a fine charge handstamp '4 C.P. 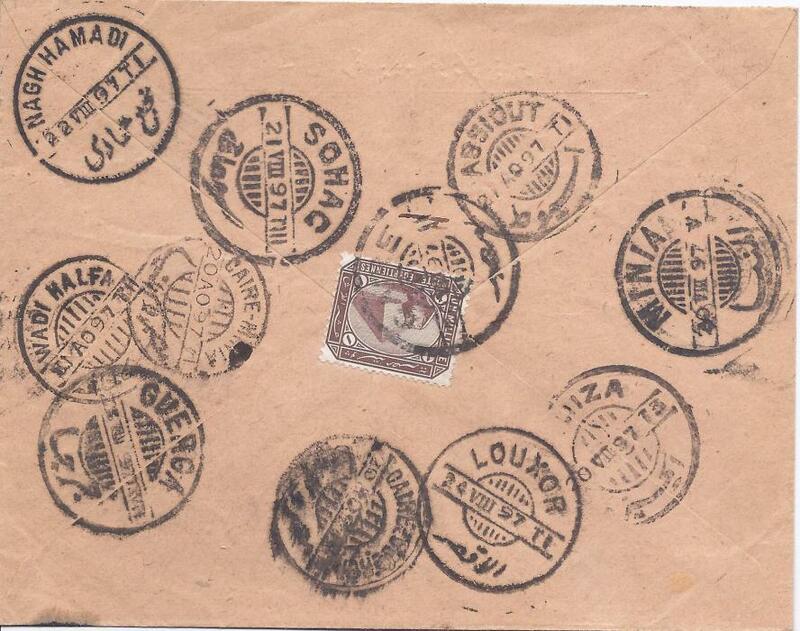 ', Larnaca arrival backstamp. A previously unrecorded handstamp. 1895 �d. 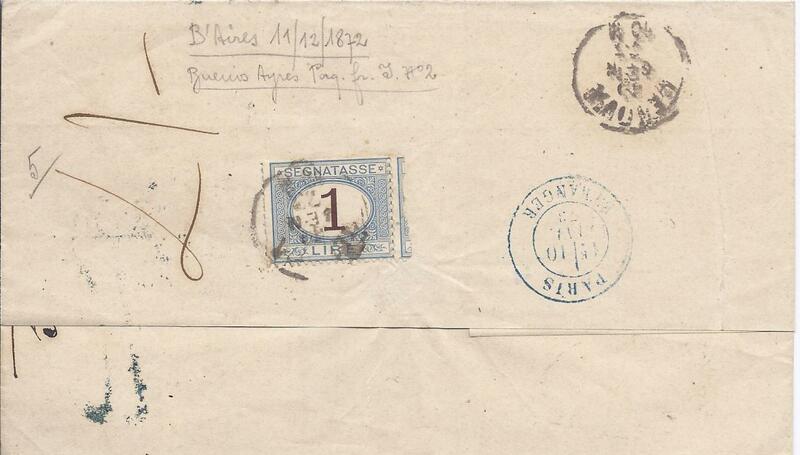 postal stationery wrapper to Montenegro cancelled Mafeking cds, blue manuscript �T� and octagonal-framed �T/ 15c� charge handstamp, Cetinje arrival backstamp. 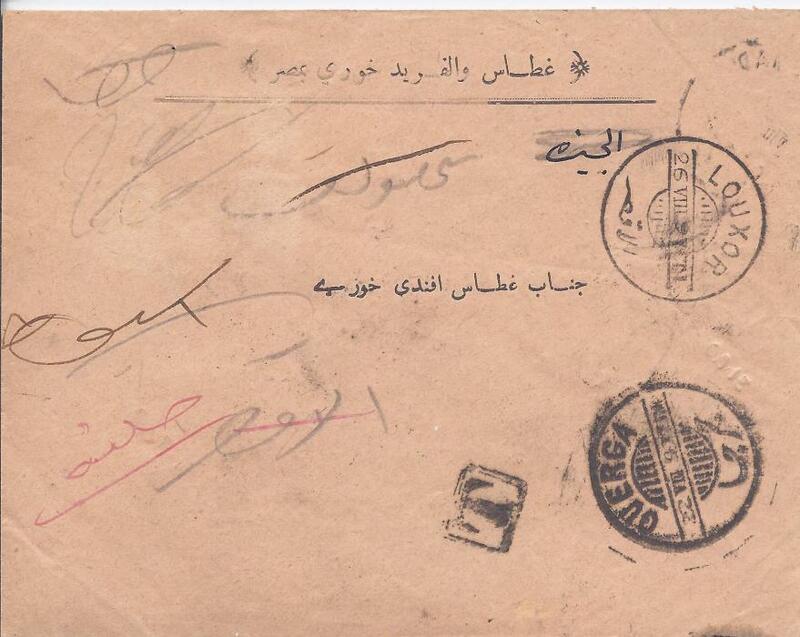 1896 stampless cover to England endorsed "No stamps available" with 'Wadi-Halfa' despatch cds, framed 'T' handstamp and '2�dD/F.B.' 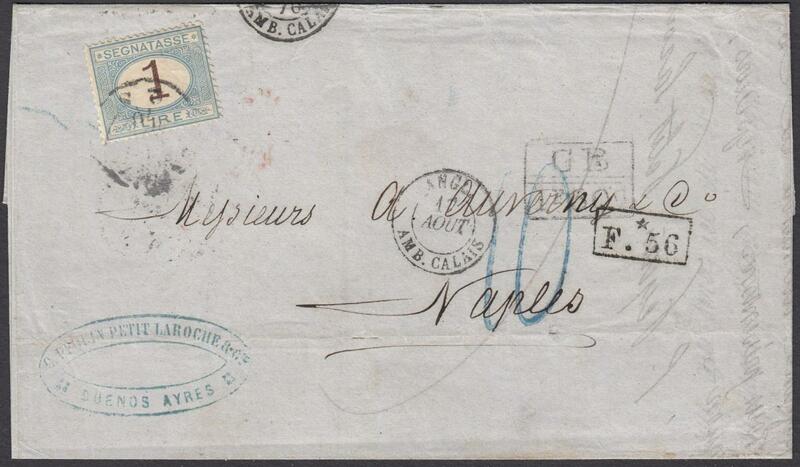 charge applied at London, reverse with 'Caire' transit cds; without back flap, scarce. 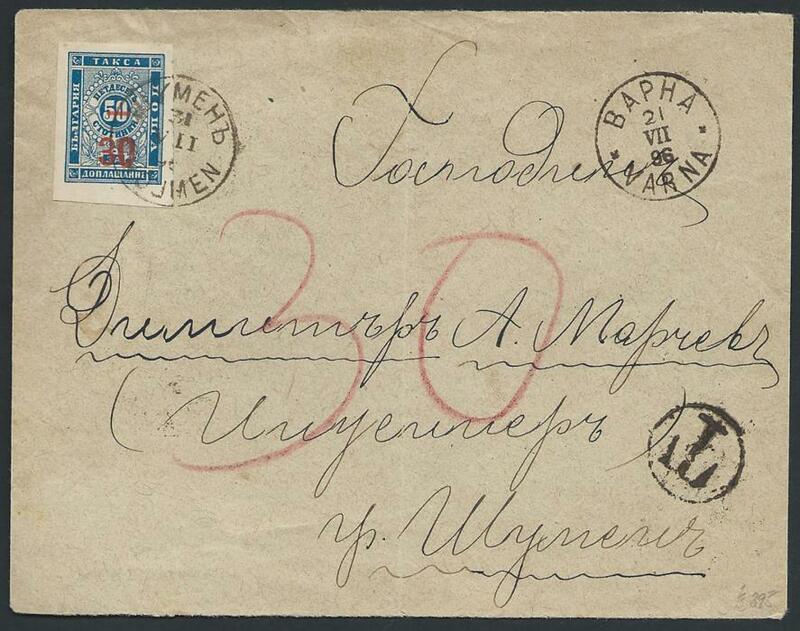 1896 Unfranked cover posted from Varna to Shumen, taxed on arrival by imperforated 30st/50st 1895 surcharged postage due issue. 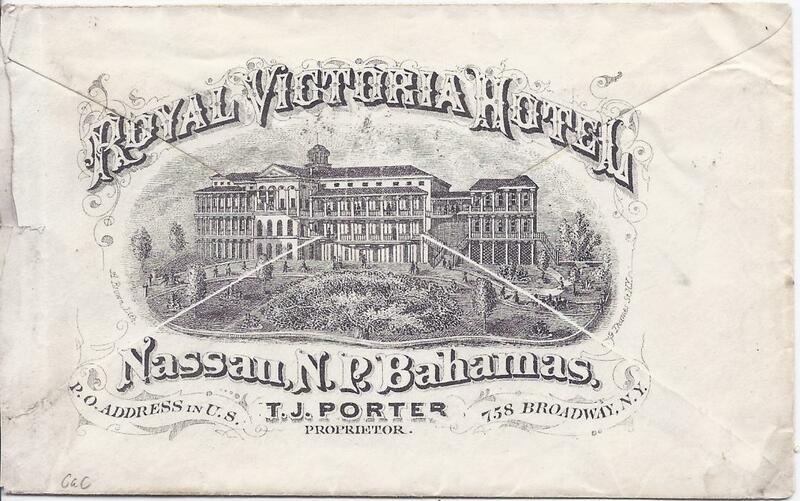 Very rare commercial usage of this imperforated stamp. 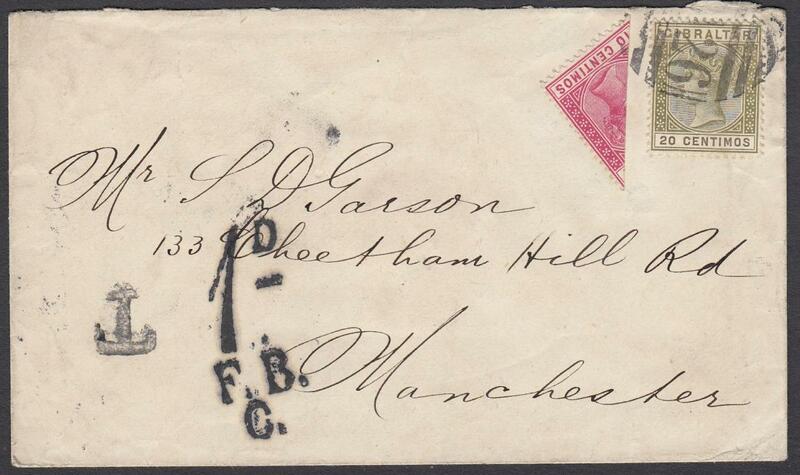 1897 cover to Manchester franked 20c and bisected 10c, tied by 'A26' obliterator, the bisect being unauthorised a 'T' handstamp was applied and upon arrival in England a '1d/F.B./C/' handstamp charge raised, reverse with London and Manchester cds. 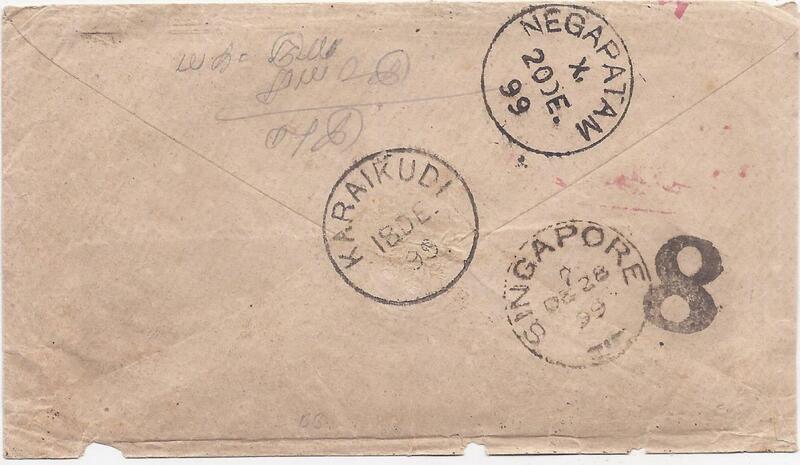 1899 incoming stampless cover from Karaikudi, India via Negapatam bearing on reverse these cancels, '8' charge handstamp and Singapore cds, the front with framed Postage Due handstamp on despatch and 'T' on arrival. Some faults to envelope. 1900 �d. 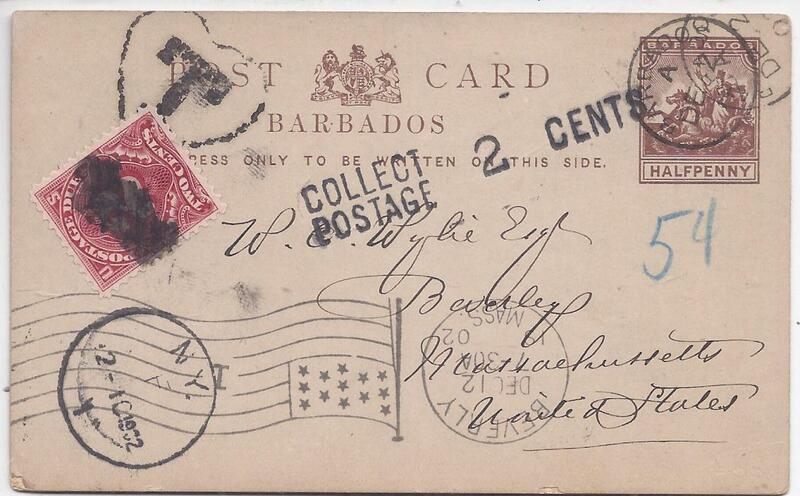 stationery card underfranked from Battery Rock to United States bearing Barbados despatch cds, framed �T� handstamp top left, COLLECT/POSTAGE 2 CENTS handstamp with a pre cancelled 2c. 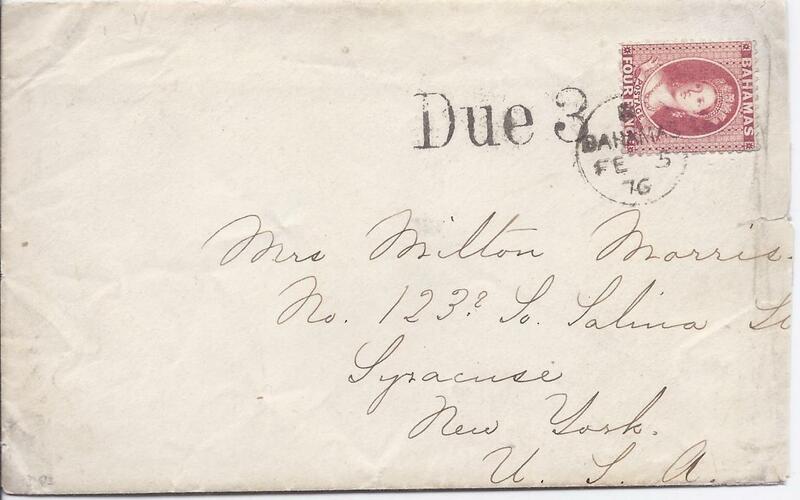 postage due applied, New York transit and Beverly Mass flag machine cancel.